Ithaca’s West End apartments are located between Downtown Ithaca and the Cayuga Lake Inlet neighborhood. 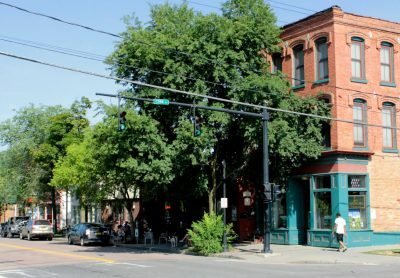 The cultural influence of Cornell University and Ithaca College is less prominent in the West End: the area has more full-time residents and genuine local flavor. Still, there are plenty of businesses and hangouts that cater to the college crowd. Looking west down State Street toward West End bars and restaurants. 509 Cascadilla St. – Single-family home. 112 North Plain St. – 2 units; (2) 2BR. The West End runs above Green Street, between Albany Street to the east and Fulton Street to the West; Cascadilla Street separates the West End from the Northside Neighborhood. West End Storefronts along State Street, near Gimme! Coffee. 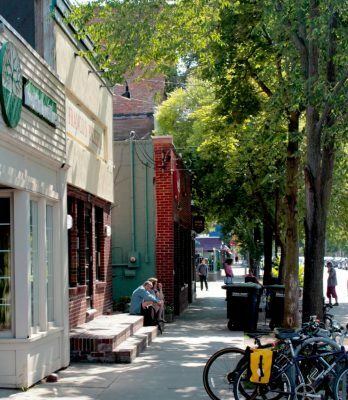 State Street bars and restaurants – The West End is home to a wide range of local eateries — everything from the quick-and-casual pizza spot and the classic neighborhood diner to the trendy farm-to-table bistro, as well as authentic international restaurants. A handful of unique brew pubs and beer gardens round out the nightlife on this side of town. Kitchen Theatre – The Kitchen Theatre is a modern local theater dedicated to supporting up-and-coming shows and performers, offering a wide range of productions to a diverse audience in an intimate setting. Washington Park – One of the largest neighborhood parks in Ithaca — an open greenspace that’s ideal for lawn games, picnics, or just hanging out on the grass. Greater Ithaca Activities Center (GIAC) – Renovated in 2010, GIAC is a vibrant community center, offering classes and recreational opportunities for children, teens, and older adults; it also has a municipal outdoor pool and athletic fields. Gimme! Coffee on State – Gimme’s cafe on State Street is one of two storefront locations in Ithaca, serving ethically-sourced coffee and espresso drinks, with plenty of indoor and outdoor seating.